Party Frosting: Penguins are done! Every year we "adopt" a local teacher for christmas and buy supplies and bring in cupcakes. This year the snow closed school early and we had our reschedule today. Since our original plan was christmas trees... we thought that since it's past the holiday, we would do penguins.... well, the Penguins are done! See below... the first picture is my finished project and the pic below is the inspiration. These were so much fun to make and see come alive! 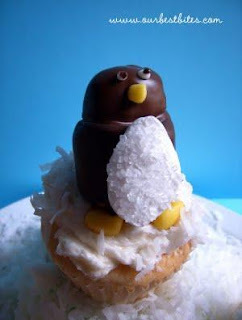 I altered from the inspiration below only in the face and cupcake (figured kindergarten kids might not like coconut). I used a pill cutter and a straight razor that's in the handle (like the kind you use for scraping paint) and cut down orange tic-tacs about 2/3 for the beak and then cut the ends off of white ones for the eyes and then dotted them with the same chocolate as the body. Here are all the guys together in the box ready to go to the kids!